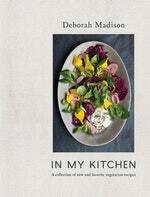 A collection of 100 of Deborah Madison's favorite and most adaptable vegetarian recipes, reflecting how she loves to cook now. repertoire, with menu suggestions and extensive tips for modifications and enhancements. Recipes like Baked Ricotta Infused with Thyme; Shredded Radicchio Salad with Garlicky Vinaigrette; Rice Gratin with Zucchini, Onions, and Cheese; and Steamed Persimmon Pudding with Persimmon Puree are appropriate for both weeknight dinners and special occasions. Also featuring Deborah's writerly, evocative prose, this is as much a book for reading as it is a reliable go-to kitchen reference. Love In My Kitchen? Subscribe to Read More to find out about similar books.